Zero Waste is sending nothing to landfill or incineration. SF Environment creates policies that reduce waste, and increase access to recycling and composting. In 2010, San Francisco exceeded its goal to divert 75 percent of materials away from landfill. Continued participation in San Francisco’s recycling and composting programs helps the City reach zero waste. San Francisco has implemented a range of ground-breaking legislation to help us achieve our goal of zero waste by 2020. Learn about our most important policy achievements. The Zero Waste Program awards funding to non-profit organizations whose work in source reduction, reuse, recycling, and composting helps San Francisco reach its goal of zero waste by 2020. Here are answers to the most common questions about Zero Waste, Recycling and Composting. Wonder what to do with batteries, paints, pesticides and other hazardous items? Do not put them in the green, blue, or black bin! Find the most convenient disposal option for you. As part of San Francisco’s Zero Waste mission, hauler uses collection trucks to communicate value of source separated organics and recyclables. Make your own recycling and composting signs! Customize your own zero waste signs with items you discard at your home or business. 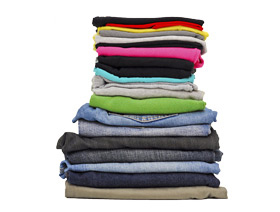 Drop off unwanted clothes, shoes and linens at a location near you. 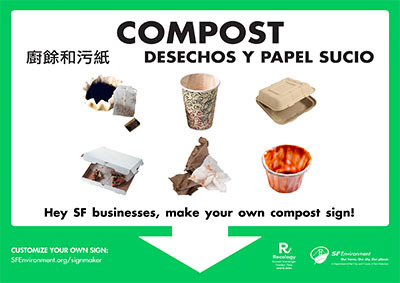 Make your own composting, recycling, and landfill signs.